I was undecided on what to bake for my father-in-law's birthday. I wanted to bake something for him, but not something with lots of frosting since we will be dining out. So I decided on a carrot cake. 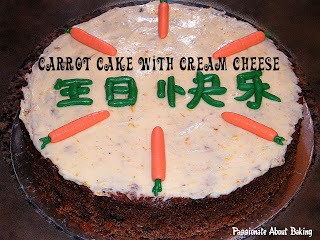 I've tried a couple of carrot cake recipes before and all of them are really good. This time, I decided to use the recipe from Rose's Heavenly Cakes (time to use it). I don't want to keep using the same recipe, and preferred to try a new recipe, even though there might be some risk involved. I frosted it with cream cheese as the way I like it, even though the recipe given was with Creamy White Chocolate frosting. Since my in-laws are not a fan of cheese, I used only very minimal and frosted it very thinly. If it was for my own consumption, I would have doubled the recipe for the cream cheese frosting and spread it thickly! *yum* I also decorated it with some fondant, just to beautify it a little. The cake was very moist, just the way I remembered and like. 1. In a medium bowl, sift together the flour, baking powder, baking soda, salt, cocoa powder and cinnamon. 2. In a bowl of stand mixer fitted with flat beater, beat the sugar, brown sugar, oil, eggs and vanilla on medium speed for 1 min, or until well blended. 3. Add the flour mixture and beat o nlow speed for about 20 secs, just until incorporated. 4. Add the carrots and the raisins and beat for another few secs to mix. 5. Add in the walnuts and mix just enough to incorporate. 7. Bake in a pre-heat oven of 175C for about 85mins, or until the cake tester inserted in the centre comes out clean. 8. The cake should just shrink from the sides of the pan. 9. Let the cakes cool in the pan on a wire rack for 10mins. Remove and cool it upright on a wire rack. 1. Beat cream cheese and icing sugar till light and fluffy. 2. Add the lemon juice and lemon zest. Beat till incorporated. 3. Then frost the carrot cake, and decorate it. 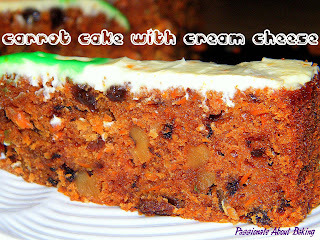 This carrot cakes was added some walnut and raisin too! Wow! I suppose the texture is great with the chewiness and crunchiness in it. Hey, you are good in Chinese words hur! The fondant is nicely done! Hahaha...I noticed you typed (finally!). Guess you finally got to bake a recipe from Rose's book. *sigh*...mine is still in the mail order. :P The carrot cake looks great! I never thought to making extra cream cheese for my bread! But I think you can't keep long right? congrats on baking your heavenly carrot cake =] I have only eaten a carrot cake once. Reading this posts makes me feel like trying out the recipe. Yeah, finally a "Heavenly Cake" bake! 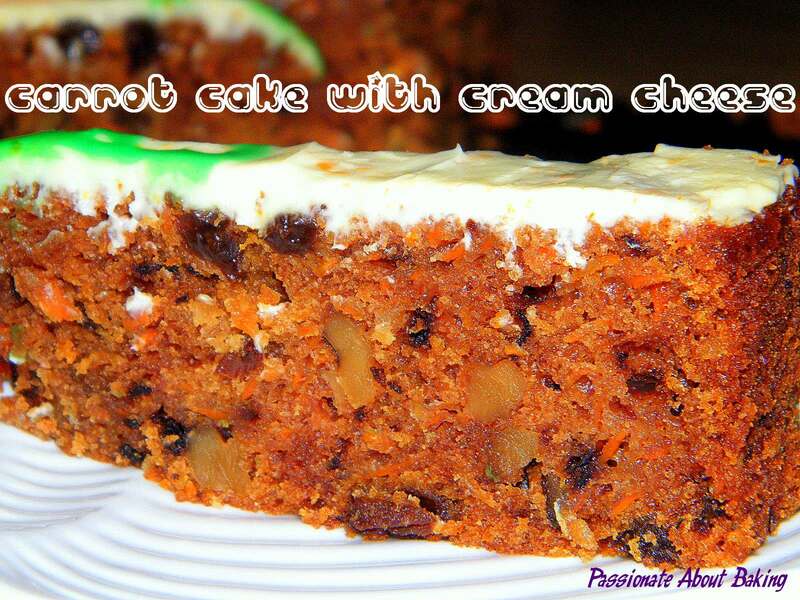 ;) I've not tried any carrot cake before until I started baking it and liking it! Do try it out!